I am happy to have Mercedes Rochelle stop by JustOneMoreChapter today with this special guest post. 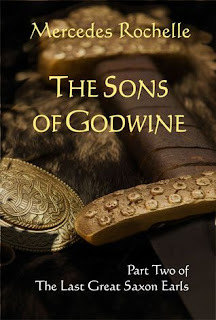 She is currently touring the blog world with her newest book The Sons of Godwine. In this 950th anniversary year of the Battle of Hastings, most of us have heard the story about Harold Godwineson (or Godwinson), last of the Anglo-Saxon kings and the arrow in his eye. But how many know about his younger brother Wulfnoth? Born about 20 years after his famous sibling, Wulfnoth was whisked away as hostage for his father's good behavior when he was only about 12 years old. In all the confusion surrounding Godwine's return from exile in 1052, he was probably kidnapped by the Archbishop Robert of Jumièges, who fled from London with the rest of Edward's Norman allies. Robert turned over Wulfnoth and cousin Hakon to William, claiming (in one version) that King Edward had declared the Norman Duke as his heir, and sent the boys along as guarantee of his pledge. Presumable the Duke did not investigate the validity of this promise. Why should he suspect the word of an Archbishop? Poor Wulfnoth was in quite a fix. After all, he was the youngest son and hence, expendable. At the time he was abducted, his father was striving to get his position back. Earl Godwine probably didn't even know his son was missing until after the fact. How culpable was the king? Could Godwine accuse him of betraying his trust? Not likely. Would Godwine have written to Duke William offering to pay a ransom for his son? Wulfnoth was not likely ever to know, and his father died the next year, which must have seemed like a catastrophe to the lonely youth. I've read some Victorian-era historians who bemoan the innocent prisoner kept under lock and key. But I suspect his confinement was more in the nature of a high-ranking son of a noble, raised in the ducal household to ensure the loyalty of the father. The captive son would be treated like a squire or even a member of the family, provisionally allowed to roam free with the understanding that he would not try to leave. Or at least, I hope this is how Wulfnoth was treated, for he never deserved his fate. I can only suspect the boy was a powerful negotiating tool for the Duke, just in case the opportunity arose. And if King Edward really did offer William the crown, of course he would keep the boy as security. There should have been no reason to put him in a prison cell. When Harold made his fatal oath to support William's claim to the throne, once again Wulfnoth had to stay as surety for his promise; it seems that Hakon was not as important, and William let him go home. Once Harold took the throne, I wonder if William was tempted to kill his hostage? If the Duke was as nasty as he is made out to be, surely one would have expected him to take his revenge. But he didn't. In fact, Wulfnoth was the Duke's hostage until the day William died; on his death bed, a repentant William the Conqueror released all his hostages. Alas, Wulfnoth's freedom was short-lived. William Rufus is said to have rushed to England to claim his patrimony, taking Wulfnoth with him. Having a Godwineson on the loose was too risky for the Norman heir; the last thing Rufus needed was a new rebellion with a puppet figurehead. Of course by then, Wulfnoth had been a captive so many years he had no friends in England, no property, nor any family left, for they had all fled the country and his sister Queen Editha had died in 1075. So he wasn't much of a threat, and the new king was content to confine Wulfnoth to Winchester, where he may have become a monk at the cloister. He died in the year 1094. 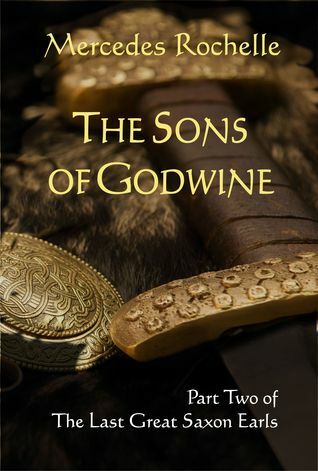 It's interesting to me that the least dramatic and least talked-about Son of Godwine is the only one to have survived the events of 1066. In my world of historical fiction, this gave him the opportunity to compile the remembrances of his brothers and finish the chronicle begun by his sister Editha. In her words: I preserved my real story, and intend to pass it on to my last surviving brother Wulfnoth, who can prepare it for a future chronicler not hostile to our house. Who is that chronicler? Myself, of course! 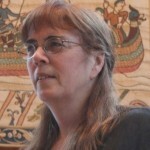 Born in St. Louis MO with a degree from University of Missouri, Mercedes Rochelle learned about living history as a re-enactor and has been enamored with historical fiction ever since. A move to New York to do research and two careers ensued, but writing fiction remains her primary vocation. She lives in Sergeantsville, NJ with her husband in a log home they had built themselves. For more information visit Mercedes Rochelle's website and blog. You can also follow her on Facebook, Twitter, and Goodreads. Emerging from the long shadow cast by his formidable father, Harold Godwineson showed himself to be a worthy successor to the Earldom of Wessex. In the following twelve years, he became the King's most trusted advisor, practically taking the reins of government into his own hands. And on Edward the Confessor's death, Harold Godwineson mounted the throne—the first king of England not of royal blood. Yet Harold was only a man, and his rise in fortune was not blameless. Like any person aspiring to power, he made choices he wasn't particularly proud of. Unfortunately, those closest to him sometimes paid the price of his fame. This is a story of Godwine's family as told from the viewpoint of Harold and his younger brothers. Queen Editha, known for her Vita Ædwardi Regis, originally commissioned a work to memorialize the deeds of her family, but after the Conquest historians tell us she abandoned this project and concentrated on her husband, the less dangerous subject. In THE SONS OF GODWINE and FATAL RIVALRY, I am telling the story as it might have survived had she collected and passed on the memoirs of her tragic brothers. This book is part two of The Last Great Saxon Earls series. Book one, GODWINE KINGMAKER, depicted the rise and fall of the first Earl of Wessex who came to power under Canute and rose to preeminence at the beginning of Edward the Confessor's reign. 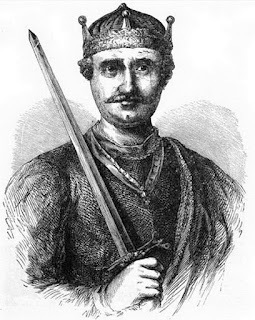 Unfortunately, Godwine's misguided efforts to champion his eldest son Swegn recoiled on the whole family, contributing to their outlawry and Queen Editha's disgrace. Their exile only lasted one year and they returned victorious to London, though it was obvious that Harold's career was just beginning as his father's journey was coming to an end. Harold's siblings were all overshadowed by their famous brother; in their memoirs we see remarks tinged sometimes with admiration, sometimes with skepticism, and in Tostig's case, with jealousy. We see a Harold who is ambitious, self-assured, sometimes egocentric, imperfect, yet heroic. His own story is all about Harold, but his brothers see things a little differently. Throughout, their observations are purely subjective, and witnessing events through their eyes gives us an insider’s perspective. Harold was his mother's favorite, confident enough to rise above petty sibling rivalry but Tostig, next in line, was not so lucky. Harold would have been surprised by Tostig's vindictiveness, if he had ever given his brother a second thought. And that was the problem. Tostig's love/hate relationship with Harold would eventually destroy everything they worked for, leaving the country open to foreign conquest. This subplot comes to a crisis in book three of the series, FATAL RIVALRY.